Spoliers and skirts and lights, oh my! Chevrolet is preparing one highly customized Camaro SS to pace the upcoming Daytona 500, and it appears that the Bowtie brand has thrown every accessory at its disposal to see what would stick. At the rear, there's a ducktail spoiler the likes of which we haven't seen on a Camaro since the late 1970s. The profile view is dominated by a ground-effects package that makes the pony car's already slab-sided, Coke-bottle appearance even more pronounced. We also note a set of wheels reminiscent of the units fitted by Hurst. And it's easy to miss the new chin spoiler and slightly modified grille. The most noticable updates, though, are surely the lights, which have to be bright enough for the entire field at Daytona to spot them. There's an aerodynamic light bar up top and a pair of orangey-yellow lamps out back that the spy photographer says could practically be seen from space. See for yourself in our high-res image gallery below. 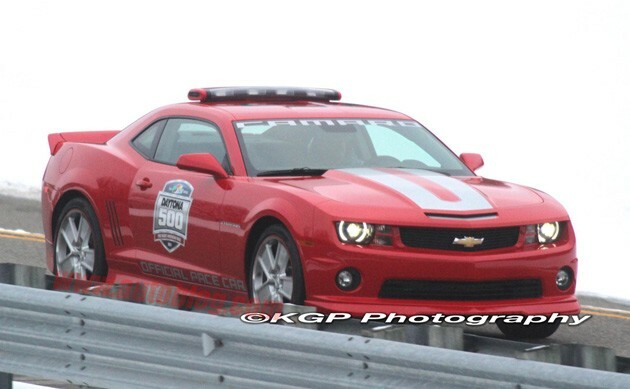 [source: KGP Photography]Spy Shots: Chevrolet Camaro SS Indy 500 Pace Car with wings originally appeared on Autoblog on Wed, 26 Jan 2011 13:28:00 EST. Please see our terms for use of feeds.